We’ve been in the back of the jeep for about an hour when the sun crawls down the sides of the globular granite hills and sinks into Jawai Bandh dam. Tiny islands of lavender stone float out across it, and scrubby trees rise up from the waters. A lone fishing boat paddles slowly homeward. This, so we’re told, is when the leopards descend from the hills. From past experience, I’m cynical about the chances of sighting one. 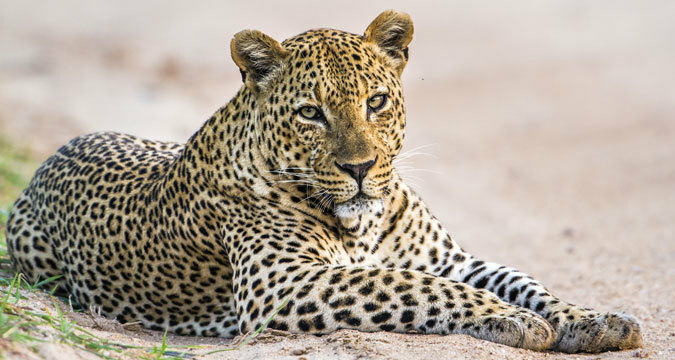 Leopards, like other apex predators, are experts at remaining hidden - that’s the whole point of lurking around in the dark, which they’ve been doing successfully for thousands of years. Not seeing one doesn’t bother me in the least; it’s wonderful to be riding around in the gathering dusk, the desert air rapidly cooling and the local tribespeople driving their buffalo back to camp, lowing. It’s a very different atmosphere here in the wilderness of Jawai Bandh to the rest of Rajasthan, the largest state in India. Set in the north-west, and bordering neighbouring Pakistan, it’s wildly diverse country, ranging from the mountainous forests outside Udaipur to the wastes of the Thar Desert. With three weeks dedicated to zig-zagging the state, we barely touched the sides of a nation it’d take a lifetime to explore properly. After decompressing in Delhi for a few days, our intrepid driver, guide and sometime dining partner Sonyu ferried us out of that heaving metropolis. Fittingly, our first destination was Jaipur, the Rajasthani capital. 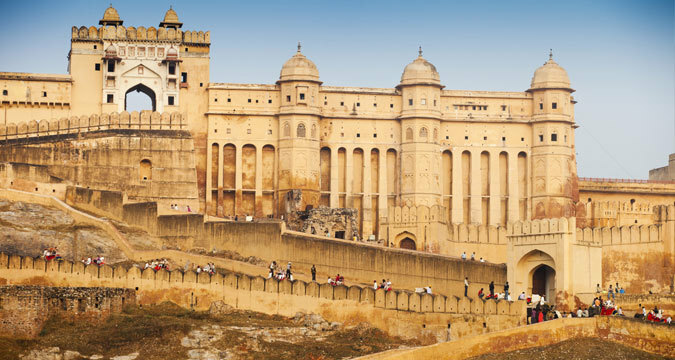 The city was founded in the 17th century by Jai Singh II, a descendent of the ancient Rajput family, the Kachhwahas, who built the extraordinary Amber Fort (pronounced am-mer). Constructed from marble and pink sandstone, the palace sits on a steep hillside, and fortified stairwells snake up the nearby range. A chain of depressed-looking elephants lump tourists up to the main gate - we felt better about the short walk. The interior is spectacular; a rambling, multi-storey castle seems to have sprouted organically. Windows are constructed from an intricate lattice of rose-coloured sandstone, which swirls into stars and diamonds, and delicate foliage and birdlife is still visible painted on the walls. Despite the abundant culture, we came as much for the grub as we did the history. Set within Jaleb Chowk, perched on a rooftop overlooking the main gateway is 1135 AD, an excellent little restaurant serving traditional Rajasthani cuisine with contemporary care. The Dahi Kebab, made from house-made hung curd and cooked over the grill, is at once tart and deeply savoury, and the Maans Ka Soweta is as good a rendition of the regional lamb favourite - prepared with sharp green chilli and millet - as you’re ever gonna get. Obviously, though, Indian dining isn’t all about the high-end - what you find on the streets is likely to be even more delicious. We trudged the pink-walled streets in search of a famed samosa-wallah, who’d set up in a gateway. His cart was weighed down with hundreds of freshly-cooked samosa - which, for good reason, are in high demand - with crisp casings made with a perfectly short pastry, spiked with spicy green chilli within. Likewise, down a laneway, we found a small trader who’d parked under a pipal tree outside a temple. He served us delightful little globes of puri he was frying in an enormous wok, topped with hot daal cooked with chickpeas, coriander, raw spanish onion and tamarind. We sat on a doorway to eat it, and watched him chase away some monkeys with his monkey-chasing stick. Jaipur also provided perhaps the best shopping experience in India, with the excellent (and ethical) Anokhi store. The company has been making hand-printed textiles for over forty years, and the quality of their clothing is impeccable. It also has deep roots in the city, employing local craftspeople to create its designs using hand-carved woodblock prints - and paying them a fair price. This was the exact point at which we realised our 30 kilo baggage limitation simply wasn’t going to suffice. Jodhpur didn’t help the situation. Well-known for its handicrafts and antiques, an elegant gold-chased Buddha I found at a local dealer pushed me decidedly over my limit. With newly-inflated bags, Sonyu transferred us to a rickshaw in order to enter the winding spiral that is the old city. Painted almost entirely in vivid blue, the medieval network of streets is still thriving today, pulsing with foot-traffic and motorcycles - not to mention cows. At twilight, clans of children raucously sing their way to temple, while fruit-vendors haul their wooden carts up the hill. Mehrangarh is the imposing centre of the town, standing solitary on an enormous rock with the city radiating out around it. While the 15th century fort is by far the most popular attraction, we preferred what seemed to be the least popular - a 72-hectare conservation park on the rear of the palace walls. While India isn’t particularly well-known for its ecotourism, Rao Jodha Desert Rock Park is a wonderful example of what’s possible in the rapidly-developing country. After the crush of Jodhpur’s streets, the serenity of Rao Jodha was extremely welcome, with its stream bordered by native plantings and birdlife. Back on the road, Sonyu delivers us into real desert country as we make our way to Jaisalmer. The scrubby bushland gives way to sparse farming country, and eventually, into a flat expanse of dunes. The occasional black goat can be seen rummaging among acacias and stones. Jaisalmer is, compared to other cities, basically a country town. Recognising as much, the locals are somehow more laid-back than their compatriots in Jodhpur and Jaipur. Like other cities popular with tourists, Jaisalmer has grown around a fort - which, unlike other forts around the country, is still inhabited today, with artists selling tiny Mughal-style miniatures and locals going about their business despite the tourist horde. The fort’s most impressive residents, however, are a series of seven Jain temples built in the 15th century. Once you take off your shoes, and deposit any leather items outside the door, the temple spaces open out into tranquil oases encrusted with the most ornate, butter-coloured sandstone representations of gods cavorting and priests meditating open-eyed. The main attraction of Jaisalmer is, of course, the desert itself. The Sam Sand Dunes, which are about an hour west, are the platonic ideal of what a desert is supposed to look like. Most visitors are roped into a camel ride out amongst the dunes, but camels and I have no affinity, so we politely declined. The view of the desert on sunset, however, is worth the drive alone. After braving the harsh sands and vicious camels, we decided we’d earned a bit of a treat. For that, we headed to RAAS Devigarh. Now, the most common advertising pitch you’re likely to hear in Rajasthan is that “you’ll live like a Maharaja!”. It’s only Devigarh where that’s true. 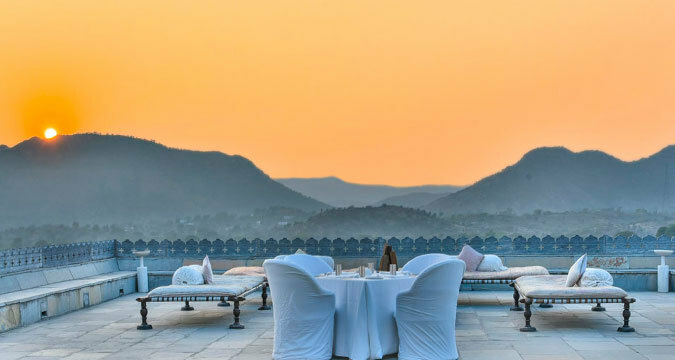 Built in 1760 on the Aravali Hills with local marble by Rajrana Sajja Singh II, Devigarh is a real-life palace, which has been restored with five-star flair. The refit is extraordinarily sympathetic, weaving Rajput design elements into a laudably understated style. Looking out over the tranquil little village of Delwara - where the majority of Devigarh’s staff come from - our room’s balcony is regularly visited by fluorescent green parakeets. An extraordinary dining hall adjoins our suite, the Durbar Courtyard, where Raj’s court would meet whenever he was in town. It’s no mere exercise in period nostalgia, however - it’s a truly beautiful room, decorated with the most elegant in 20th-century minimalist design. This, we decided, was a good place for a drink. Dining is as good as its environment at Devigarh, where chefs use seasonal produce that’s grown both locally and on-site. The slow-roast lamb shoulder, served with freshly-made roti bread and cardamom-scented biryani, needed to be ordered 24-hours in advance - but the wait was more than worth it. Despite the opulence of Devigarh, it was staying in a tent that made the most lasting impression. Not just any old tent, mind - a Relais & Châteaux tent, to be precise. 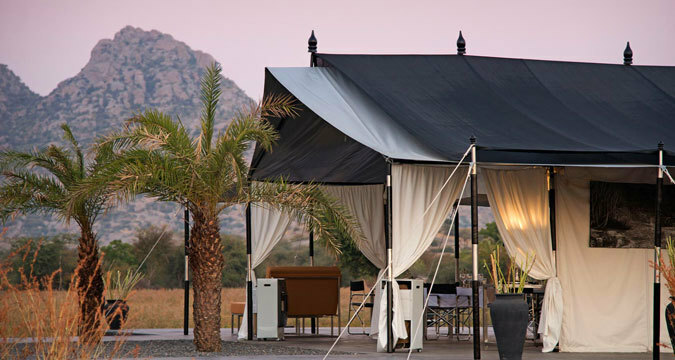 Set up in the grassland between the gorges of Jawai Bandh, Sujan Jawai is situated in true wilderness. 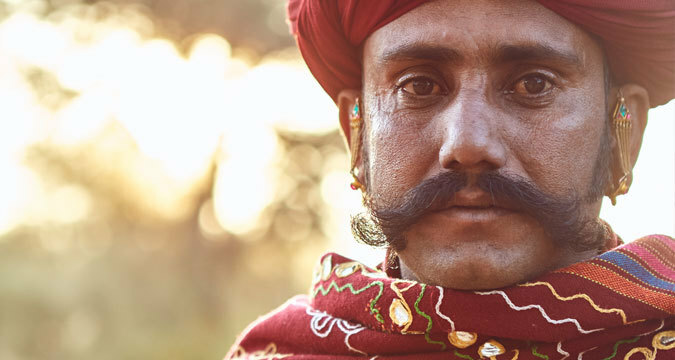 Small communities of nomadic herdsmen, the Rabari, still roam the hillsides. On an early-morning walk our esteemed host and guide, Prateek, disclosed a gallery of ancient cave paintings, laying undisturbed for centuries on the side of a small hill, their origin still unknown. Antelope, langur monkeys and even hyenas roam the mountainsides. Back at camp, however, we’re hardly roughing it. The shower pressure in our tent is the best we’ve had in India (and it’s air-conditioned, too). 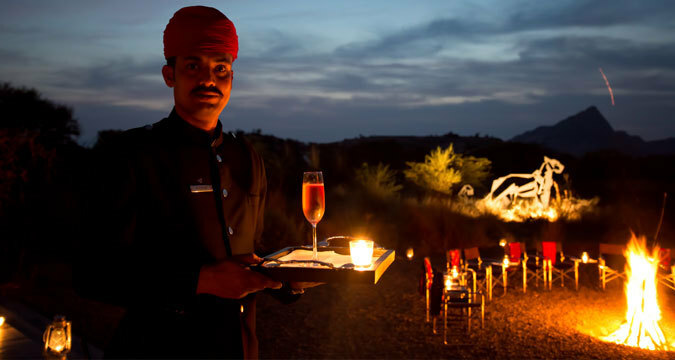 Chefs prepare a mélange of Indian-inflected Western cuisine and traditional dishes with vegetables grown in their own garden, which is served by campfire at night. The gin and tonic is on-point. What we’re here for, though, isn’t just the luxury. It’s the leopards. The people of Jawai have a unique relationship with leopards. Across the country, most villages have driven the nocturnal hunters out over the last few centuries, reviling them for killing livestock and, occasionally, children. But here in Jawai there’s a rare harmony between human and leopard - locals consider the sacrifice of a sheep or goat a blessing, a small price to be paid for the spiritual protection offered by the cats. And, true to their word, the leopards leave their people in peace, while they themselves are thriving.